Hey, hey, Zeke here! I’m back with another game from Japan. This time we’re doing something a little special: we’re going to look back at a previous game in the form of an expansion. 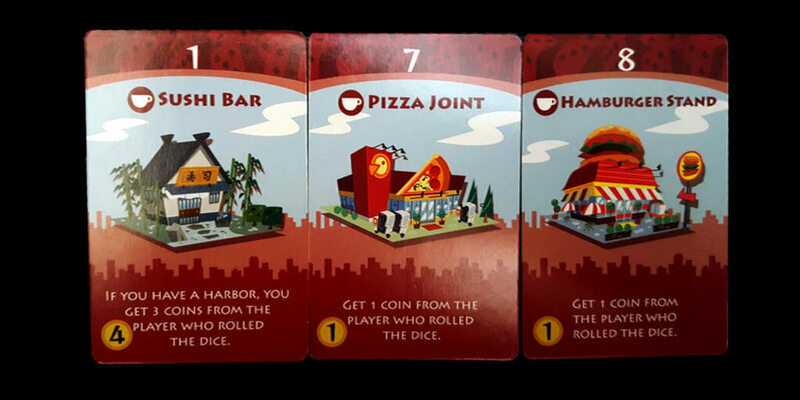 The Harbor Expansion for Machi Koro adds several new establishments, two new landmarks for you to construct, and even support for a fifth player. Add to all this a new way to play the game and you have quite the update! 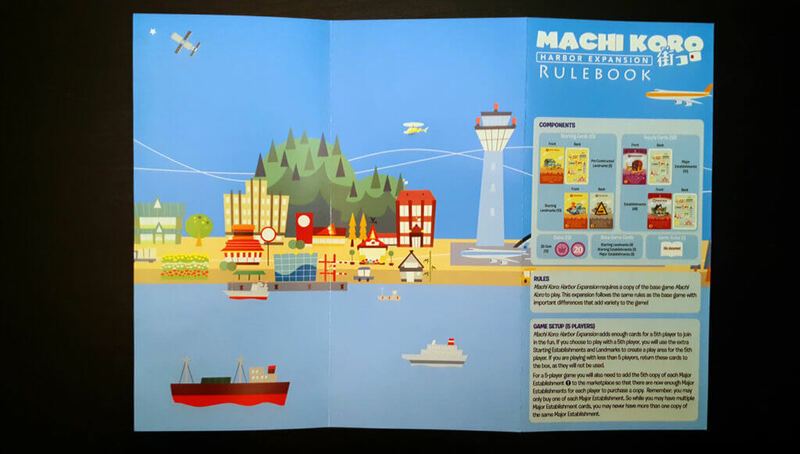 If you haven’t read my Machi Koro article or are unfamiliar with the game, I suggest you go check it out before continuing! 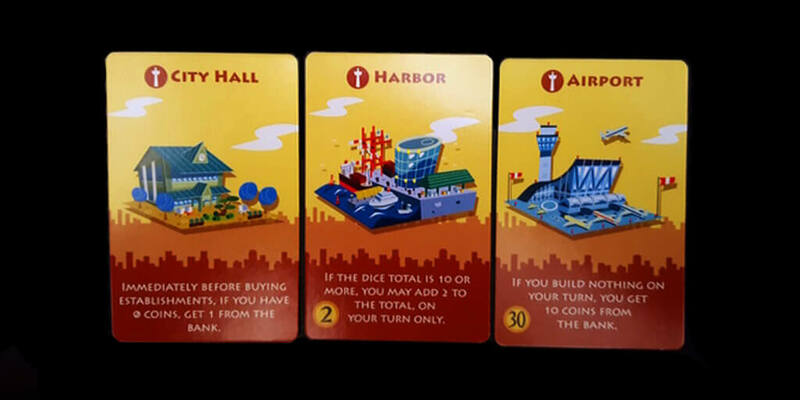 The Harbor Expansion requires the base game to play. 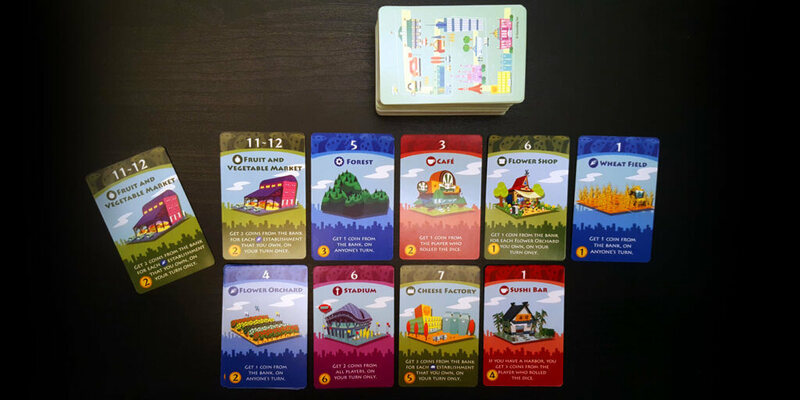 Included in this box are a full set of starter cards, landmarks, and major establishments to support a fifth player. New cards have also been added to the game to change up the pacing and strategy options. The Landmarks are back, and constructing all of them is still the goal of the game. Brand new is the addition of a pre-constructed landmark, along with two new ones to build. Yes, you have to build the new ones too! 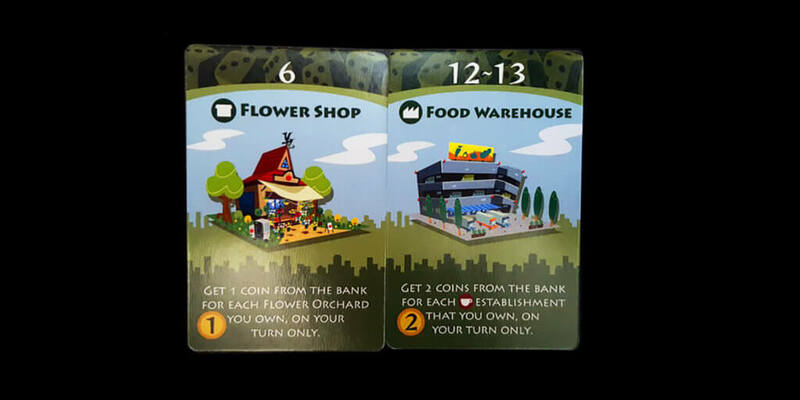 Primary Industry cards act just as they did in the base game, acting on any players turn. The expansion adds three new ones, two of which use the new Harbor landmark. Secondary Industry also gets a boost with the addition of two new cards, both of which have the ability to combo with cards in the base box. Remember these only activate on your turn! There are three new Restaurants that have been added to the game. These bring brand new ways to take coins straight from your opponents’ own savings account. The Major Establishment category has been expanded with two new cards. However, you can still only have one of each of these powerful cards in your town at a time! Set up is still a cinch. 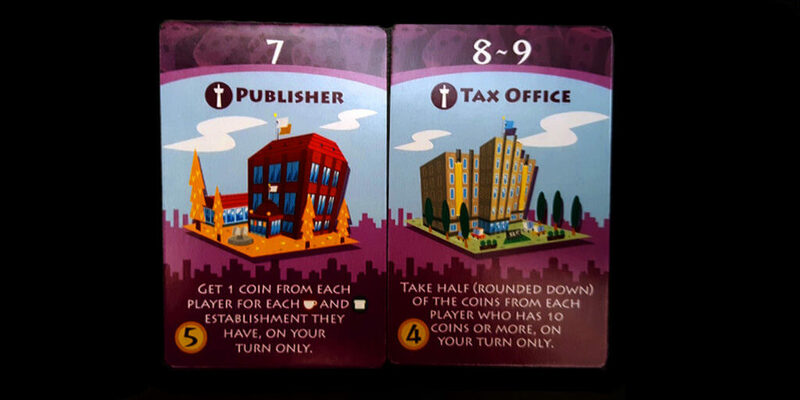 Each player still receives a stack of cards containing their starting establishments and landmarks (remember that you now start with the City Hall pre-built in front of you). Now, the Marketplace set up is where this expansion really differs itself from the base experience. Instead of simply placing all the establishments face up in nice, orderly piles, you shuffle them all into one huge pile and deal them out face up. If you would deal a card that is already out on the table, simply stack it with the other one(s) and keep dealing until you have filled out ten piles. Much different from the static card pool in the original game! Another note here: if there would ever be more of a major establishment than there are players, the card is returned to the box and a new one is dealt. A player’s turn still consists of three phases: rolling the die (or dice), earning income, and construction. During the construction phase, if there would ever be less than ten cards in the marketplace, replenish it back to full using the rules for the original dealing. Dice rolling remains as it did before, with a player rolling one die on their turn, unless they own the train station and choose to roll two dice. The income phase also works the same as the original, with each player earning money from their respective establishments based on the die roll by the active player. Construction works nearly the same way, with the only difference being that now the establishments change every game. This leads to interesting choices, since the guaranteed strategies are now gone. So what do you do, buy the best property each turn or hold out for a combo with something later, knowing it might not show up? Even worse, a property may not be there next turn if someone else has snatched it up! Once a player has wrapped up their turn, the dice are passed to the next player in a clockwise order and play resumes. Turns continue until someone has built all six landmarks. 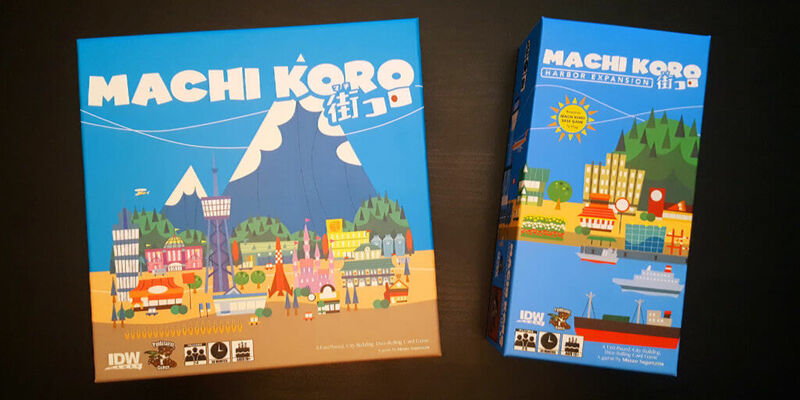 The person to complete this task first is declared the greatest mayor and the winner of Machi Koro! I have to say, I really like what this expansion adds to the game. Not only is it excellent to have five player support (the size of a nice DnD group I might add), but the randomness added by the new marketplace dealing method ensures the game feels different each time. No longer is there just a few paths to victory, and any path can be blocked at any time by someone taking the only copy of a card you need off the table. Even with those pluses, my group and I do have have a few comments to make about the new system introduced in the game. While it is nice to have random cards, this also means you may be stuck with high priced cards for a long time until someone can buy them. Or the middle will get filled with 7+ dice roll cards and no one has a train to utilize them, and so no one buys them. What we also noticed was that a couple of players dominated most of the game by getting a few good rolls early in the game and buying up all the cheap cards in the center, including restaurants, which made the problem worse by taking money away from the poorer players. What we would like to try next time is to combine the two rule sets. We’d like to try a small “always available” pool of cards, perhaps the low-cost cards. Many deck building games use a similar idea, possibly to prevent some of the problems I mentioned above. I’ll be sure to let you know how it turns out when we get the chance to try! So in wrapping up, I think that if you like the base Machi Koro game, you will have just as much fun with the Harbor Expansion. It’s more of what you love about the original with some new twists and updates to keep the game feeling fresh. There is still one more expansion I have to purchase and sample, so look forward to reading about it! Until next time, be sure to keep playing games and searching for that next table favorite! Interested in owning the game? 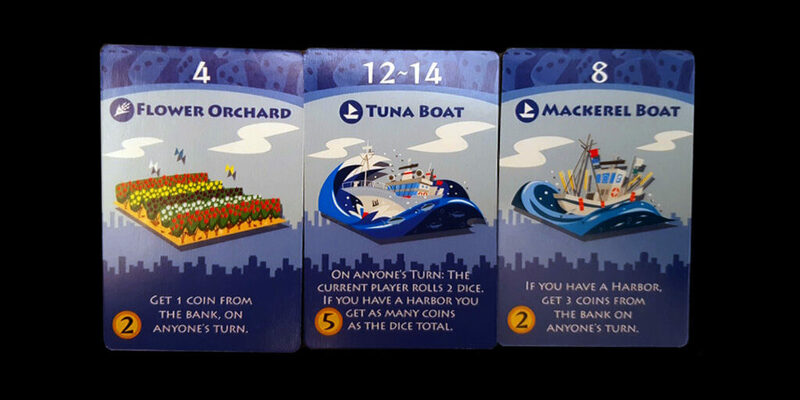 You can purchase Machi Koro: Harbor Expansion on Amazon.